In 1977 US marines were ordered not to talk about a Bigfoot-like creature. "I haven’t gotten any [Bigfoot] on camera yet," -- Jessica Shively, current wildlife biologist contracted my Quantico Marine Corps Base (2012). Today, January 17th, in 1977. 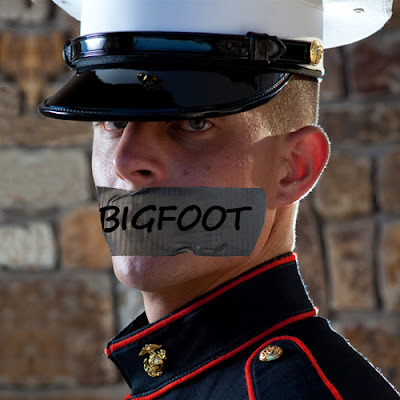 The Dumfries Virginia Potomac News reported that U.S. Marines were ordered to not to talk about a Bigfoot-like creature. The creature was known as the ASA Monster, leave it to the military to use an acronym to name a cryptid. ASA stands for Ammunition Storage Area. The ASA happened to be where this hairy bipedal creature was seen the most. "We called the ASA (Ammunition Storage Area) sergeant of the guard to determine whether there had been any more sightings or sounds in the area but were told that all information regarding the "ASA Monster" is considered 'classified.' When asked why that is so, the guard answered that he was not allow to answer that question either. He later said that the information is not really 'classified' but everyone at the compound has been ordered not to talk about the monster at all." We did a little research, curious if therewas still policy of silence regarding Bigfoots at the base. Oddly enough Quantico Marine Corps Base has their very own website and it seems they are more lax about acknowledging Bigfoot visiting the base. In fact, in November 2012, the website reported a story about Jessica Shively, a wildlife biologist contracted by the base through Virginia Tech. Ms. Shively is responsible for setting up camera traps at the base and is aware that she just might catch a Bigfoot. Shively acknowledged that the cameras have the potential to shed light on another, more longstanding question about Quantico’s wildlife. She said she was aware of the reports of bigfoot sightings on the base going back more than 50 years. "I haven’t gotten any on camera yet," she said. Click the following link to learn more about the Quantico camera traps. There is a government cover up! Good stuff Guy. I was told by a Maine witness, they had sightings up North..you guessed it, at the ammo bunkers. Said there were cargo containers that *something* would toss around like toys. Big heavy containers. I guess they used heavy equipment to move them. I got some comments on the Bigfoot Lunch Club Facebook Page (http://www.Facebook.com/BigfootLunchClub) mentioning other military sites with activity; Bridgeport California, Edwards Air Force Base and Camp Pendleton. I wonder if they were also near ammo bunkers? GREAT STORY GUY! THERE ARE KNOW BIGFOOTS IN MAINE YA NITWIT!!!! THINK U ARE GETTIN UR STORIES MIXED UP!! OOPS! I MEANT, THERE ARE "NO" BIGFOOTS IN MAINE!!! What ! No big foots in Maine? Are you sure? LOL. You just keep looking I am sure one will pop up sooner or later. I am loving these history post Guy keep it up. Thank you Lee. I got them lined up for the whole year! After beginning investigations into "extraordinary phenomena" in 1965, we began receiving calls from Law Enforcement Agencies across Maryland and each adjoining state, which included Delaware, Pennsylvania, Virginia and West Virginia. Quantico U.S. Marine Base was NOT one who ever called, but UFO & Creature Sightings were mostly reported in an infrequent basis. I must add, in Spring 1973, an large number of 'creature sightings' began along the Patapsco River, east & west of Sykesville in southern Carroll Co., Maryland. Some reports spilled over into northern Howard Co along the Patapsco River, south of Sykesville & north of West Friendship, MD. Between 1965 & 2002, we handled some 7,127 requests to investigate creatures, UFOs & strange land mammals. The MD. Game Commission/Natural Resources Agency refused to investigate all such calls, claiming such animals were NOT native to Maryland. Some of our activities were written up in The Maryland Bigfoot Digest, the Baltimore News-Post, The Sunpapers & City Paper. For what it's worth, the father of my college girlfriend (early 70's) was editor of the Potomac News in Dumfries, VA in that time period. (So, it was a real paper). During vacation periods, I would drive down (30 minutes) from NW Fairfax Co. to visit the area ... never saw anything there. Quantico is just south of Dumfries and Triangle. Across Rt. 1 from the base is the Prince William State Forest, where I believe there was a BF sighting way back. Also, further north, in the woods along the Potomac River, near GW's estate, Mt. Vernon, in the 1970's, there was a report of activity. P.S. My dad trained at and went to OCS at Quantico during WWII. Anonymous, I am constantly amazed at the LACK of knowledge of the use of the English language. An apostrophy S, is supposed to be used to show OWNERSHIP, not for pluralization. The time period mentioned should be 1970s. No apostophy !!!!!!! There is something out there, and it's obviously much smarter that we are in order to have avoided public detection for so long. Once we confirm the presence of Bigfoot (Gigantapithicus, Neanderthal, etc), I can guarantee you that a large portion of their DNA will be IDENTICAL to most of us modern humans.